Like most days as an adult at my parent’s house, September 25, 2012, began with coffee and breakfast. We talked about family and friends, caught up on the news, and mostly, avoided discussions of politics. It was good to be surrounded by loving parents in my childhood home. I had been there only a few precious days and already we were quickly falling into the comfortable routine of just enjoying each other’s company. At the time, I was in transit between adventures on different continents, visiting with friends and seeing more of the United States, while waiting for the obligatory paperwork to be finished so I could go exploring again. But, even if it was only for a short time, I was “home”, that special place where when you have to go, they have to take you in. It was nice to be welcomed, loved and even a bit spoiled. Around mid-morning mom and dad left to run a few errands and were going to have lunch. I was of course invited but declined because I also had a few things I wanted to catch up on. I was a bit surprised when they returned earlier than expected. With the usual smile on his face, dad said he had “a little headache” and wanted to rest, before they went back out. That was a bit unusual because he never complained about feeling bad, much less did he ever let it slow him down, but I didn’t think that much about it. He was quieter even than usual and when mom and I asked him again how he was feeling he said, “I think I am getting better”. I went to a different part of the house and continued work on my projects. But, he wasn’t getting better. About half an hour later I returned to check on him. I found mom lovingly and carefully tending to him because he had become nauseated. She had also called 911. He was alert and even seemed a bit embarrassed about the attention he was getting. The paramedics arrived quickly and I let them in. They quickly and professionally began examining dad. There were about three of them and they each efficiently performed their tasks. The last words I heard my dad say were to the paramedic who asked him how he was feeling. The next time I saw my father was about twenty minutes later when mom and I arrived at the hospital emergency room. My sister was already there. She was obviously concerned but, as is normal for her, steady as a rock. Dad still had the serene look on his face but the light in his eyes was absent. The paramedics had put a ventilator in on the way to the hospital. Tellingly, there was no longer an apparent sense of urgency. While we were waiting for tests and medical rituals to be performed I called my ex-wife in California and asked her to tell our son what had happened. My son has always adored his grandfather and I felt bad that the unenviable task of breaking this news fell to her. I didn’t want to say it out loud but I did and told her she should prepare him for the worst. Upon hearing this, with her usual grace, amazing compassion and without hesitation said they were going to start packing up and be on their way. After the initial emergency room exam and testing, any pleas for encouragement were met with downcast eyes, shuffling feet and medical jargon. It was becoming increasingly clear that my father was gone. The only question that remained was whether or not his body was still alive. Confirmation came the next morning. A massive stroke had taken my dad and only machines were keeping his body from final peace. In some ways he was lucky. He left this world the way he wanted, quickly, without much pain and with a serene grace and dignity. Selfless to the end, he had avoided one of his biggest fears, having to be cared for by others. That afternoon the doctors came to remove life support. Everyone knew it was the best thing, inevitable even, but naturally, we were concerned and no one had prepared us for what to expect. We all left the intensive care room while they removed the ventilator and we returned a few minutes later. Dad was laying there, arms relaxed at his side like he was peacefully sleeping. The only thing out of place was the incongruous location, medical personnel roaming around, and the fact that he was still hooked up to the heart monitor; which was still functioning; 72 beats per minute. His heart was strong but after several minutes its beating began to slow. We all just kind of milled around, downcast, tears in our eyes, glancing at each other, quietly sobbing, touching dad’s arms as if to comfort him and waiting helplessly knowing that the graph on the heart monitor’s screen was soon going to go flat. It was hard. Intellectually everyone knew this was just confirmation of an event that had occurred the day before but that knowledge was cold comfort. Here was this man, this great man, a husband, the man who gave my sister and me life, my hero … at the end of his physical life … slowly winding down. Then, it was over. There was no confirmation other than the flat line on the heart monitor. His mind, and now his body were together at peace. Intellectually everyone knows it is normal for children to outlive their parents. That is the way of the world. Knowing that doesn’t make it easier. When news of dad’s stroke and his passing got out we were immediately overwhelmed by an outpouring of sympathy and compassion from many wonderful people. We received unexpected kindness and condolences from people we didn’t even know he had known. His humanity had touched so many. The following days were a blur. We tried our best to remain in good humor and as upbeat as possible like he taught us, but frankly, we were all a bit numb. Friends and family started arriving from all over the country and flowers started arriving from all over the world. There is no way I could convey how grateful my mom, sister and I are to all those who reached out to us during this time. As everyone gathered we laughed and cried and just generally celebrated my father’s life. The assembly turned out to be just the kind of event my father would have loved even though he would have been embarrassed to be the subject of it. Too bad we don’t have parties like this for the living. 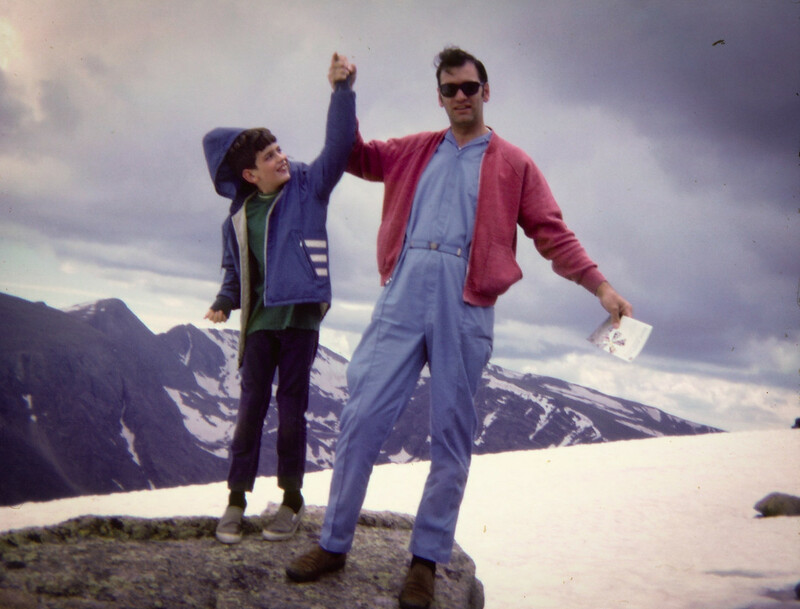 I think one of the reasons dad was liked by so many people was because he genuinely liked people. He always saw the best in people even when there wasn’t a lot to see. He nurtured and provided for us, not as an obligation to be endured but, out of pure love and the happiness it brought to him and our family. Our joy was his joy. An interesting thing – About a month before he died, out of the blue, dad initiated a conversation with me that, at the time, seemed a bit out of character. He reminisced about his life and said, even though he said he wasn’t ready to go, that if he were to die that day, he would die a happy man. He talked about being grateful that he had lived long enough to see his children on happy paths and long enough for his grandchildren to know him. He talked of good friends, the rewards of seeing a large part of the world and how he took pride in providing for our family. His words were those of a man who was comfortable with himself, the life he had led and his place in the world. Of all the gifts I have ever received from my father, and there were many, this conversation is the most precious gift of all. Knowing that he was proud and happy, so much so in fact that he wanted to share it with me, gives me immeasurable comfort every day. He taught me to respect challenges and work through them. Even though we took strikingly different paths through life and, although I sometimes think he was concerned about the decisions I made, he was proud to have raised someone who was independent and brave enough to make them. I felt his love even in the times I knew I was disappointing him. Rightfully, it was never his intention to choose a path for me but to give me the tools with which I could make my own decisions and have a good life. His guidance and wise counsel prepared me for life and any mistakes I have ever made are my own. He admired my wanderlust and told me, even though my ways were not for him, he was proud that I blazed my own path instead of just talking about it. I miss my father every day. The world is less because he is not in it. We didn’t always see eye to eye but I respected him more than any other man on the planet. He does live on through family but even more importantly the legacy he left behind. I love you dad. Thank you for your good deeds. You did well. So sad, but what a wonderful way to honor your father! Well done. Thank you Maria. He was a a great man. Truly my hero. John, we have been traveling and I missed this post. After reading your loving tribute this morning, I wanted to offer my condolences to you on the passing of your Dad. It is clear you had a wonderful relationship with him and your words would make him proud. Cherish those memories……they are sweet and moved my heart today.